Suggested Use: 1 tablet daily as a nutritional supplement. Biotin has helped many a poor sufferer of problems with skin, nails, hair, muscle aches, fatigue, and diabetes. 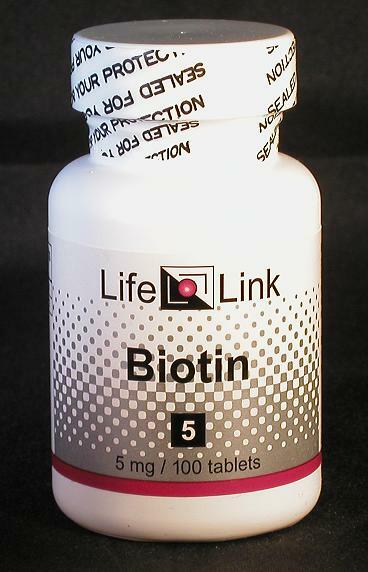 Biotin is a water-soluble B-vitamin that is involved in the metabolism of carbohydrates, fats and proteins. It is essential for life, growth, food utilization, maintenance of epidermal tissues, normal bone development, and sexual function. Studies suggest that high biotin consumption may correct certain serious diabetic symptoms, particularly when combined with chromium picolinate. Recommended biotin dosages range from about 150 mcg/day (minimum requirement) to 15 mg/day (5 mg x 3 times per day) for diabetic use. Biotin’s bioavailability varies widely with different sources, but deficiencies in humans are rare. Certain drugs and supplements (such as alpha-lipoic acid), and raw eggs, can cause deficiencies; the symptoms usually begin with dry skin and expand to include brittle nails, dermatitis, hair loss, fatigue, depression, nausea, muscle pains, high cholesterol, heart problems, anemia, and birth defects. Studies suggest that high biotin consumption may correct diabetic hyperinsulinemia, insulin resistance and weight-gain, particularly when combined with chromium picolinate. Recommended biotin dosages range from about 150 mcg/day (minimum requirement) to 15 mg/day (5 mg x 3 times per day) for diabetic use. Alpha-lipoic acid users should probably take several milligrams of biotin per day (but not at the same time as an alpha-lipoic acid dose, since they compete for absorption). Biotin is without side effects up to at least 40 mg/day.